The jury of this edition was comprised of Michelle PROVOOST, Jurg DEGEN, Elisabeth MERK, Markus PERNTHALER, Christoph LUCHSINGER A, Henri BAVA L, Marcel SMETS, Peter Istvan BALOGH and Lulzim KABASHI. This project gives a phasing proposal of city development. 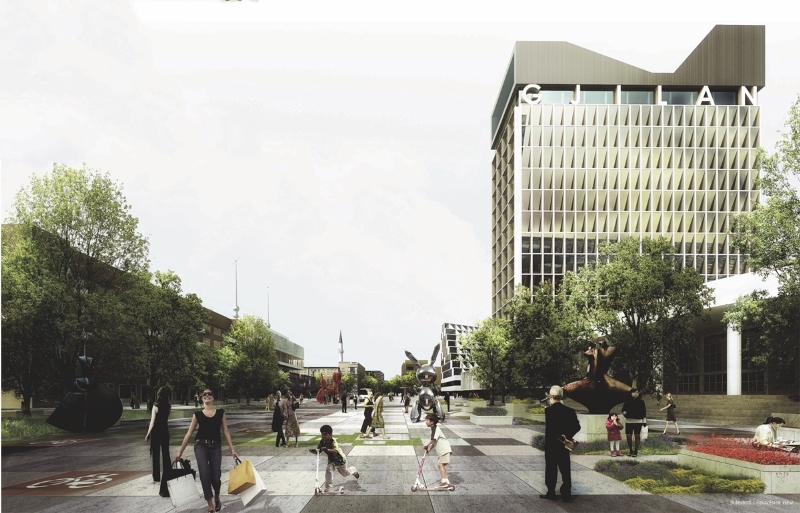 As the other projects it is dealing with public space and 3 proposed buildings as required from the municipality. Traffic is organized that public transport, bicycles and pedestrian movement to be allowed all the way through the axis while car traffic is not diverted to pass in the main square. The axis are treated as one strip of functions where the main square embraces multifunctional activities of three proposed buildings. The public space is improved with green elements. This project is a bit different from the others since it is treating the space with smaller structures. What is specific about this project is that it is fragmenting the space by creating smaller public spaces. This is done by these small structures that have to be built around the intervention area. All the functions are spread along the axis. The main square is functioning with 3 types of building. TEAM: Cristina Cordero Mora (ES), architect; Ferrain Viladomat Serrat (ES), building engineer; Arnau Sane Riera (ES), architecture student; Enric De La Hoya Nolla (ES), architecture student.